Whenever you create a file or folder, Windows Me scrawls a bunch of secret hidden information on it: its size, the date you created it, and even more trivial stuff. 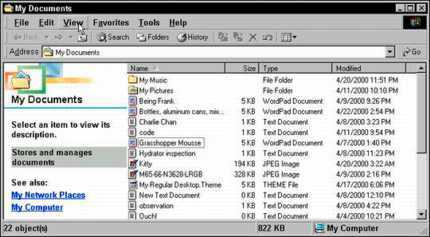 To see what Windows Me is calling the files and folders behind your back, select View from the folder’s menu bar and then choose Details from the menu. Instead of seeing large icons with names beneath them, you see bunches of details, as seen in Figure 1. Figure 1: To see more details about a folder’s contents, choose Details from the folder’s View menu. Is the toolbar not living on top of your window? Put it there by choosing Standard Buttons from the View menu’s Toolbars option. That little bar of buttons now appears atop your window like a mantel over a fireplace. If you can’t remember what those little toolbar buttons do, rest your mouse pointer over a button and pretend it’s lost. Windows Me displays a helpful box summing up the button’s mission, and, occasionally places a further explanation along the bottom of the window. Although some of the additional file information is handy, it can consume a lot of space, limiting the number of files you can see in the window. Displaying only the filename is often a better idea. Then, if you want to see more information about a file or folder, try the following tip. While on the right side of Explorer, hold down the Alt key and double-click a file or folder to see its size, creation date, and other exciting computer information. With the Alt+double-click trick (described in the preceding paragraph), you can change a file’s attributes as well. Attributes are too boring to be discussed further. At first, Windows Me displays filenames sorted alphabetically by name in its Windows Explorer and My Computer windows. But, by right-clicking in a folder and choosing the different sorting methods in the Arrange Icons menu, you display them in a different order. Windows puts the biggest ones at the top of the list, for example, when you choose Sort by Size. Or you can choose Sort by Type to keep files created by the same application next to each other. Or you can choose Sort by Date to keep the most recent files at the top of the list. When the excitement of sorting wears off, try clicking the little buttons at the top of each column — size, for instance. That sorts the contents appropriately — the largest files at the top, for instance.